GrabHitch May’s Race to the Top! – GUARANTEED rewards to be given out! We have a new rewards program lined up for you in May. Complete 5 rides to get a $10 Starbucks e-voucher. 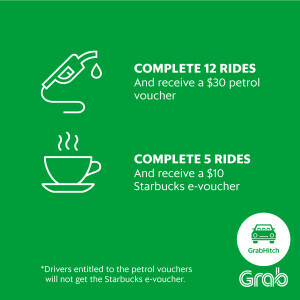 Complete 12 rides and get $30 worth of petrol vouchers*. Sign up now to be eligible for May’s Race to the Top! *Drivers entitled to the petrol vouchers will not get the starbucks e-voucher.